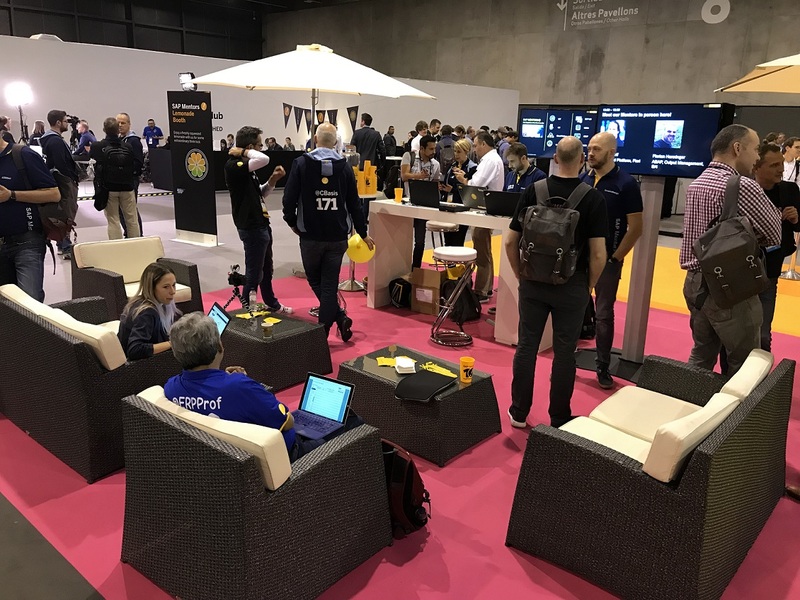 Barcelona was the last SAP TechEd of 2017. It was supposed to be the culmination of lessons learned from previous TechEds, ideas you had in the back of your mind but was too afraid to voice, and for some, another opportunity to share their knowledge in-person with those seeking it. Thanks to our SAP TechEd team, the event in Barcelona did not disappoint! I especially liked the improvements to the Community Clubhouse with its blinged-out carpeting and sheer amount of new and familiar visitors it attracted. SAP Mentors stepped up to help improve engagement and to give attendees a memorable experience since they understand it is important for anybody involved with TechEd (organizers, attendees, speakers and exhibitors). I’m most proud and thankful of Mentors for staffing the Mentors Lemonade stand (booth), giving Mindfulness sessions, leading showfloor tours, and conducting soft-skills seminars in the Mentors Room. And let’s not forget #goatspotting activities with Capra. There is much more to be thankful for, including Bjoern Goerke ‘s invitation for Mentors to stand and be recognized during his keynote. As with previous post-TechEd blogs, I want to share with you a series of interviews Mentors hosted or participated as guests in Barcelona. I feel these live interviews show some of the best qualities of SAP Mentors – curiosity and willingness to share! Thanks to Jason Lax for coordinating most of these interviews. Sit back, relax and enjoy these 19 interview replays! Don’t miss Mentor Florian Henninger’s interview with Mentor alumnus and Head of CxP Engineering in SAP IT Oliver Kohl and Gali Kling Schneider Head of SAP Community, as they speak about the SAP Community’s Path Forward. SAP Solution Manager: A Hacker Tool or a Tool for Security Administrators? Mentor Christian Braukmüller gets to the bottom of this question with Frank Buchholz, SAP Security Architect. Mentor Ann Rosenberg speaks to Ben Christensen SAP Next-Gen Purpose Driven Innovation Manager about Science Fiction or Fact? Ann Rosenberg and Global Director of Innovation Charlotte Bui speaks to Ben Christensen about the #sheinnovates movement, and how it is helping to expose female technologist in our ecosystem. Diego Dora speaks to fellow SAP Mentors DJ Adams and Gareth Ryan about career opportunities opening up because of cloud-based computing. The Case for a New Role: The Cloud Platform Technician. Education at TechEd is not complete without a chat with Thomas Jung, Mentor Alumnus and Chief Product Expert for SAP HANA. Christian Drumm finds out What’s New in SAP HANA Native Development. Midhun VP learns about the journey towards SAP Leonardo from Ulrich Klingels and Ralf Becker from the SAP Knowledge team. Your Enablement Path Towards SAP Leonardo. On the showfloor, Sylvie Otten Sollod gets the perspective of Mentor Oliver Schreiber about Differentiating in a Digital World. Bonus: Spotlight on Developer Heroes! Learn from Mentor Christian Drumm, Lars Hvam, Wouter Lemaire and Abdulbasit Gulsen what motivates them. For more SAP Mentors videos, interviews and discussions, be sure to check out Rafael Guimbala‘s blog post SAP Mentors at SAP TechEd Barcelona (where you’ll hear from Mentors in different languages :-)).